All Broward Home Health Services is a Medicare Certified, CHAP accredited, home health care agency providing services including skilled nursing, home health aides, physical therapy, speech therapy, occupational therapy, and social services. We serve all of Broward County in the South Florida area. Our Company is founded on a history of caring for others. We offer both full medical services as well as pschiatric home health nurses for treatments such as wound care, high-tech infusion, Foley care, diabetic management, skilled observation and assessment, psychiatric one-to-one therapy, medication monitoring and many other nursing procedures. Services rendered by Registered Nurses and Licensed Practical Nurses consistent with a treatment plan established by the patient's attending physician. Registered Physical Therapists and Physical Therapy Assistants work to help patients regain physical function and improve range of motion. Therapists assist and/or train patients with gait training, use of wheelchairs, walkers, artificial limbs, etc., and pain control. Certified Nursing Assistants assist patients with activities of daily living and personal care. Our staff can also provide respite care to allow caregivers time away from the stresses of caring for a loved one. From grooming, bathing, preparing a light meal to light housekeeping, our staff is available for a vast number of personal care duties. We offer services on a per visit basis. Registered Occupational Therapists and Occupational Therapy Assistants help each patient learn to better perform activities of daily living. Activities may include eating bathing, grooming, dressing, and toileting to promote independence. Registered Speech Therapists provide an effective speech program assisting patients in learning to better use and comprehend language. Enhanced written, spoken, and nonverbal communication helps patients gain greater independence and improved quality of life. House calls? Yes! In most cases, we can arrange to have a physician visit a client in their home. Please call for more information. Service area is limited and client must have Medicare as the primary insurer. No HMO's or Advantage Plans. For our active clients, we can arrange for delivery of Durable Medical Equipment (DME). We can also shedule home diagnostics such as lab work, X-Rays, EKG's and more. Just as the name implies, home health care is the ability to provide services in the patient's home. Most experts agree that the home is the best environment for healing. Most people are unaware of the number of services we can provide in the home. Give us a call. Patients can benefit from home health care by alleviating the need for extended stays in a hospital or a nursing home. People are often amazed at the number of services that can be performed in the home. We can send nurses, home health aides, physical, speech and occupational therapists in the home. We can also coordinate respite care to allow caregivers a well deserved break. Other services such as X-Rays, phlebotomy, medical equipment, and many other services can be delivered/provided without ever leaving home. Home health care is covered by Medicare (either Part A or B), Medicaid and most private insurance. All Broward Home Health is a Medicare provider. Our services are provided at NO COST to the client. Other insurers may have different criteria for services. You should consult your provider for more information. Ancillary services, such as DME or phlebotomy, may have copays or deductibles. I only need the assistance of an aide. Is that covered? This is a very important area, especially when Medicare is the insurer. Medicare will cover the cost of home health care by a certified agency. In most cases, patients are under the care of a home health agency for a limited time. Patients sometimes become very used to having a person assist them with personal care duties and want to continue those services. However, Medicare ONLY covers services associated with the treatment of a condition. Once the patient's goals have been met, the patient is discharged from care. Patients may opt to continue receiving care at their own expense. This is usually referred to as, "custodial care" and it is not covered by Medicare. Under Medicare, the patient can choose any home health agency that is certified by Medicare. If you are not satisfied with the staff or quality of care you are receiving, you should first try contacting the Agency Administrator and voice your concerns. If you are still not satisfied, you can change agencies with a few phone calls. Contact your Doctor and tell him about your request. In most cases, another agency can continue services the very next day. Also, you cannot be forced to use the agency of either the hospital or physician. Ask for a provider list. In Florida, if you have a complaint, you can call the Agency Hotline at 888-419-3456. Why should I use All Broward Home Health Services? All Broward Home Health Services is family owned and operated. In this day of multinational corporations where everyone is a "number," All Broward Home Health Services makes every attempt to have each client receive personalized attention. All Broward Home Health Services is one of a few companies clients can call and speak directly to one of the operators if they desire. The owners/operators have over 80 years of combined experience in home health care. 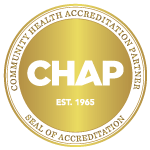 We are certified by Medicare, licensed by the State of Florida, and accredited by Community Health Accreditation Partner (CHAP). We've cared for family members of our employees and we've even treated members of our own staff in their time of need. Their confidence in choosing All Broward Home Health Services speaks for itself. So if you or a loved one needs home health care, call us at 954-933-3162.